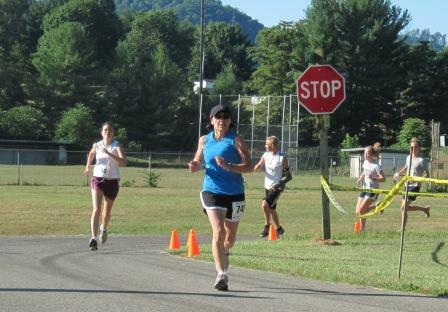 On July 3rd I ran a local race. It's normally held on the 4th, but since the 4th was on a Sunday this year they had the race the day before. We (thankfully) had a little break in the weather so it wasn't as dreadfully hot as normal. This race was a 5K. I don't generally like 5Ks, as I'm not a speedy person, but they do serve for an excellent speed workout. This was my first 5K since the twins so I didn't expect much from it. The race went well enough. I tried to keep my friend Trina in sight, as she was just ahead of me, but I lost her after the first mile. I got to scope out a few yard sales along the route. My ob/gyn, who is a runner (why else would I have picked him? ;-)) passed me around the halfway point. He had been running with his kids. He has 10 of them! 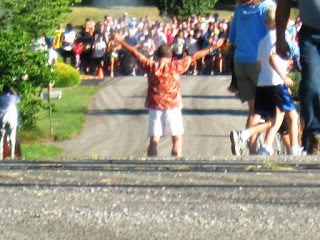 I'm in the white tank w/ purple shorts. At the start of mile 2 I had to see two different teenagers puking. I tried to shield my eyes. I am the world's biggest puke wuss and I hate to see/hear/smell/think about it. I stayed pretty consistent throughout I think. I hit mile 1 at 8:10, mile 2 at 16:50 and mile 3 at ???? What? I don't know my time? Nope. No clue. See, I don't wear a watch to run. I get picked on a lot because of this, but I don't want to be constantly worrying about it. I run by 'feel'. That's good enough for me. But I do like to know my time at the end of the race. I can say with assurance that I was faster than my personal 5K worst (29:11) and slower than my personal best (23:00). I was somewhere in the 25 minute time zone. But what about the time clock? Nope, no time clock at this race. And there was a guy doing the timing as I crossed the finish, but he wasn't yelling out the time for me. But what about the online results? Right. Well, that's where I expected to find out my time. So I started checking the results online the next day. Nothing. Nothing the day after that. Or the day after that. Finally, a week later, I found some results. They said MEN'S RESULTS. But where were the women's results? Ah yes, a little footnote said, "Women's results coming soon". Um, is putting race results in a pdf file rocket science? I mean, I don't know, I've never tried it, but it must be very, very technical, huh? I think your personal worse 5K time is better than my personal best! Running without a watch? Why, that's like blogging without a comments section! Hee! Good for you to keep perspective on why you're running in the first place, and not get obsessed about times.